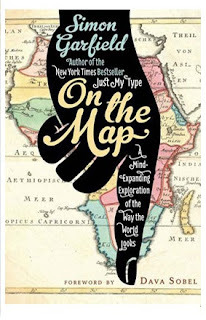 On the Map is a fascinating book. Garfield obviously loves maps, and his infatuation is contagious. He rhapsodizes on the history of maps and their beauty, the people who created maps and the people who used them. Explorers and monks, scientists and artists, sailors and doctors – they all found their places on the pages of this book. 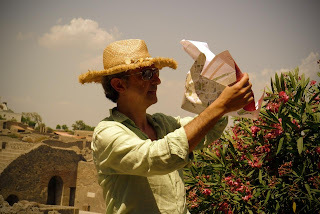 From ancient Greece to Google, maps have been a part of human life, and the author traces the evolution of the world maps through the centuries and around the globe. In addition to the mass of meticulously researched but slightly dry facts, he includes plenty of engaging stories in his chapters. The book is ripe with those stories. One of the more fascinating tales involves the reason why America is not called Columbus. Some stories are about the creation of famous maps, while others are anecdotes, tales of human gullibility, or accounts of extreme courage. Some are tragic while the others are whimsical or hilarious. After the amazingly precise maps of the ancients—the most famous being Ptolemy’s map—Europe experienced a decline in cartography. For the next more than 1,000 years, the world maps produced in Europe were mostly mappa mundi. Some of them survived to this day. Usually, such medieval maps centered on Jerusalem. They had nothing to do with geography and everything to do with the religious view of the world – in pictures and words. Morality tales in visual form, they were frequently filled interesting-looking beasts of the creators’ imagination. One of those beasts was Bonacon – a ram-like creature, shooting its ordure at its enemies as a defense mechanism. A charming species, to be sure. Of course, those maps were not intended for travel but were rather philosophical statements of the time. Then, when the great journeys of Columbus and the rest of that bunch took place, Ptolemy’s map became popular once again, and serious cartography rose in prominence. There is a myth that Columbus himself had a copy of Ptolemy’s map with him, when he sailed for India and discovered America instead. Talk about the reliability of old maps! The first Atlas and the history of travel guides, the city maps and the original British Ordnance Surveys (where even toilets could be found) – the enormous upload of information in this book is overwhelming. Names, dates, and places abound, but the numerous amusing interludes, sprinkled though the book, make it supremely entertaining as well as educational. Did you know that on the world maps, California was an island for two centuries, starting from 1622? Last time it appeared as on island in 1865 on a map produced in Japan. Another interesting tidbit: the legendary Mountains of Kong – the invented, impassable mountain range that crossed Africa west-east on the maps from 1798 on for almost a century. Or how about this morsel: for one Middle Ages pilgrim, it took 230 changes of donkeys to get from Bordeaux to Constantinople. And of course, the man recorded his travels for posterity. From geographical maps, the author proceeds to imaginary maps and treasure maps. There was an industry of treasure maps blooming in the middle of the 20th century. One could buy an Atlas of Treasure Maps for $10, filled with sunken ships and buried pirate treasures. While some of the maps were frivolous or outright silly, others were almost heroic. Did you know that during the WWII, the Monopoly makers secreted high-resolution maps of several European countries underneath the game boards in a few special sets? Those sets were then sent by Red Cross to the Nazi’s concentration camps in Europe, attention of the military POWs. Some of those maps helped the captives escape. Garfield also mentions game maps (think D&D or Skyrim) and fantasy book maps, brain mapping and the reviving business of globe making. He discusses the power and potential for disaster associated with the new digital maps – Google, GPS and the like. What will happen, if all the GPS units stop working, he wonders? Or start working incorrectly? Mind boggles at the thought. Will we all drive into the ocean? The book is engrossing and informative, written in a clear, precise language, and peppered with humorous asides. It includes lots of enthralling illustrations. Highly recommended for anyone – a map enthusiast or not. About the Reviewer: Olga Godim is a writer and journalist from Vancouver, Canada. Her articles appear regularly in local newspapers, but her passion is fiction. Her short stories have been published in several internet magazines, including Lorelei Signal, Sorcerous Signals, Aoife’s Kiss, Silver Blade, and other publications. In her free time, she writes novels, collects toy monkeys, and posts book reviews on GoodReads. Her first novel, Lost and Found in Russia, has just been released from Eternal Press. Thanks Olga. I'm a huge map enthusiast. This book sounds fascinating. I'll be picking this book up just as soon as I get to a bookstore. This book surprised me too. I was never interested in maps before. Now I'm a convert. This author has another, older books about fonts. Can you imagine what could be interesting about fonts? But the book was a bestseller. I'm going to read it. Naida: what will happen when your GPS stops working? :-) The section of the book where Garfield describes various occasions of malfunctioning GPS is the funniest in the book. Sound interesting, I really enjoyed "What's My Type" by the way. Does Mr. Garfield touch on the point that even today's map (as most of us know them) are not truly accurate?